Jewelry made out of tungsten carbide has numerous benefits over other popular metals like gold, silver and platinum. For one, it is one of the strongest metals known to man and won’t bend or warp under pressure. Tungsten’s strength combined with its scratch-resistant properties work together to keep pieces looking as good as the day you bought it, even 10 or 20 years down the road. The durability of tungsten jewelry is well-known which is why so many men are choosing pieces crafted out of high-quality tungsten, and because of its popularity, jewelry designers have now expanded beyond just tungsten to include bracelets. 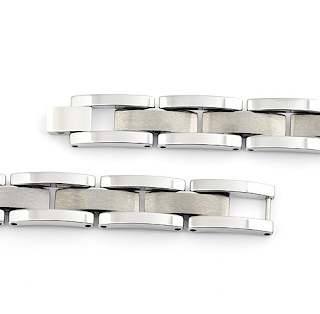 A tungsten bracelet still offers all of the above benefits while opening the door for men to accessorize with stylish pieces that aren’t flimsy, cheap or too flashy. This two-tone tungsten bracelet for men is a prime example of that. 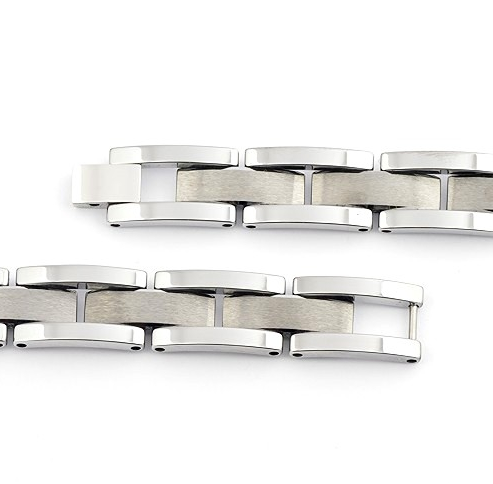 This bracelet is made out of high-quality tungsten carbide and uses a nickel binder. The center links of the design are diamond brushed and have a matte finish while the outer edges are smooth and polished for a shiny finish. It also features an easy to put-on and take-off fold over clasp (shown below) and measures 12 mm in width and 8 ¾” in length. Simple and classic, this is a piece a man could wear every day for any occasion. Before tungsten jewelry came around, shopping for the man in your life was usually pretty tough. 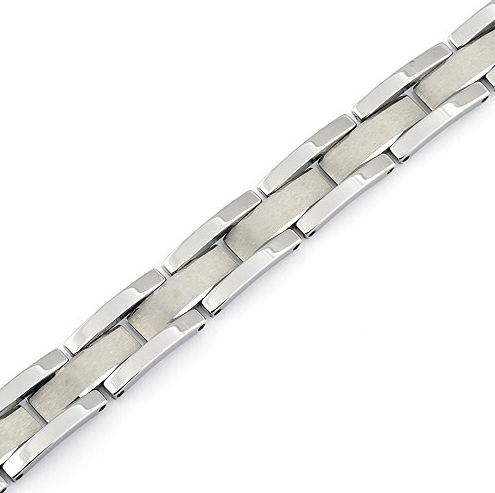 Pieces like this tungsten bracelet are make the best gifts for men because they can stand-up to just about anything a man can throw at it and their sleek and contemporary styles let men wear jewelry without feeling to flashy or dressed up. And if you need it in a hurry, Lovie Art Jewelry ships orders the same day when ordered before 2:00 PM CST Monday – Friday. 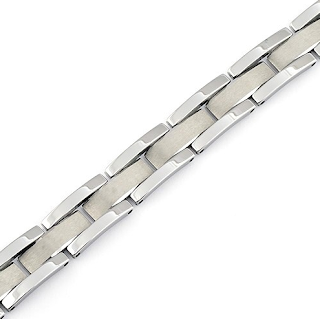 This is only one of many contemporary tungsten bracelets we offer. To check out our full selection of tungsten bracelets, click here. Shop www.lovieartjewelry.com for great discounted pieces including engagement rings, wedding bands, and wedding ring sets for men and women. We offer free domestic shipping and warranties on many of our pieces! Bracelets have emerged to be an essential men accessory. Bracelet for men does not only represents a strong character and a form of self-expression, who have the will and strength to succeed; but also what makes you look fashionable.